Bigger, bustling Quito may get more of the glory, but after spending a week on the ground in both locales, it’s smaller-scale Cuenca – Ecuador’s third-largest metropolis – that wins hands-down for urban charm. It’s little wonder that this colonial city, with roots dating back to the indigenous Cañari people, and later, the conquering Incas, has proven so attractive to legions of settlers. It lies tucked away into a verdant Andean valley where four rivers meet. In fact, affordable Cuenca is now luring a new flock of settlers, with a recent wave of American retirees making it one of the most popular expat pensioner communities in the Americas. After a week of clobbering Cuenca’s cobblestones, here with a budget-friendly cheat sheet on what to do – and where to sleep – on the cheap. Uncover Cuenca’s charms simply by ambling. Its UNESCO-protected old town is filled with colonial-style balconied buildings with tucked-away courtyard oases, domed churches, and manicured plazas, all set alongside the stroll-worthy pathways of the Tomebamba River. On the main square, peek in at the New Cathedral (free), the city’s largest structure, showcasing a mix of Romanesque and Gothic styles, and, just across the way, visit its predecessor, the Old Cathedral, the oldest building in Cuenca, dating back to the mid-16th century; it now functions as a museum of religious art (admission $2). Swing by the Central Bank Museum (free) for a sampling of the country’s cultural history. Dedicated sections display depictions of various Ecuadorian cultural groups; religious and colonial artwork; the country’s numismatic history; and pre-Colombian archeological finds (including a collection of shrunken heads!). 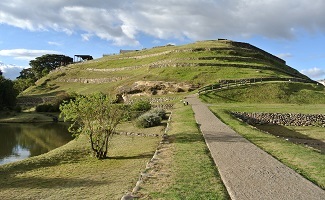 Just behind the museum, stick around to peruse the archaeological park of Pumapungo (free; pictured to right), where excavated foundation walls serve as a reminder of the hillside Incan palace that once stood here. The best views of the site are from the botanical gardens and small aviary below, well worth a stroll (and entirely free to access). Take in a sweeping panorama of the city and its valley setting from the Mirador de Turi (pictured above). Get there with cash to spare aboard the budget-friendly double-decker City Tour bus, offering hop-on, hop-off service for just $5 ($2.50/kids). With time to spare, there are day trips worth taking. Ten minutes by car, the Piedra de Agua thermal spa offers attractive thermal baths (entry $10/adults; $5/kids) and budget-friendly spa treatments (30-minute massages from $20) in nearby Baños. Cajas National Park, a 45-minute trip, lets you take wilderness hikes alongside more than 200 blue lakes. For archaeological buffs, a two-hour drive north to Ingapirca rewards visitors with Ecuador’s premier Incan ruins. Tour company Pazhuca Tours offers reasonably priced excursions to both sites for about $40 each, including guide services, transport, and lunch. Bunk down in the one-and-a-half-year-old Casa Lloret Hostal, a family-run hotel helmed by a friendly, English-speaking hostess, who resides just next door. A great-value alternative to the pricier digs downtown (though it’s just 10 minutes from the city center via a $2 cab or 25-cent bus ride), the hotel is situated in a quiet residential neighborhood near the Mall del Rio shopping center and the Yanuncay River. Two-family suites offer separate bedrooms and kitchenette/living room areas with extra sofa bedding; seven additional standard single and double rooms offer comfy and clean quarters, with modern design schemes and plasma TVs. (Tip: Book the “Gallo de la Peña” room for great mountain views and private terrace access.) Save even more by stocking up on groceries (a small supermarket is just next door), since all guests get communal kitchen access. Wi-Fi, parking, and daily cooked-to-order breakfasts are included in the rates. Rates from $40/singles; $70/doubles; $110/family suites.